ALAKHI SANGORI, GEORGIA. Mariam Aptsiauri and her husband Anzori Aptsiauri in their home on August 1, 2010. 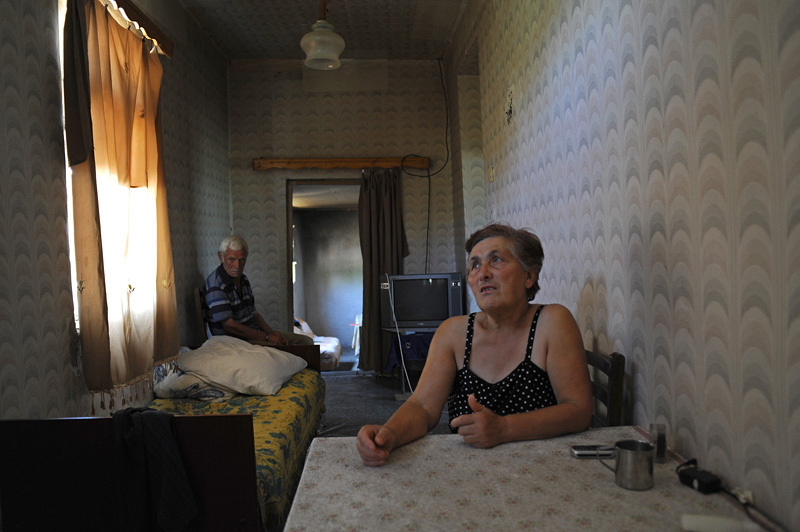 While the Aptsiauris have received nothing yet in compensation for having the Baku-Tbilisi-Ceyhan oil pipeline traverse their farmlands, destroying the possibility for continued agricultural production there because of damage to the topsoil and live in poverty, their neighbor Gia Obgaidze is likely the largest recipient of compensation funds in Georgia, which he used to start a chicken farm in addition to remodeling his home; according to an attorney who formerly handled compensation issues with the Young Lawyers Association, Obgaidze likely received 187,000 Georgian lari or approximately $100,000.